Valentine’s Day was so simple when we were kids. Mom would buy one of those small packs of cards you’d write on the back of and those tiny, little boxes of conversation heart candies. There’d be butterflies in your stomach when you thought about whether or not to give one to your secret crush. As we grew up, Valentine’s Day quickly became one of those holidays with pie-in-the-sky expectations. The perfect romantic dinner at an expensive restaurant, love-inspired gifts, red roses by the dozen and cards with just the right sentiment. So much pressure for just one day on the calendar. We’d like to propose a beautifully simple, personal and delicious alternative: Date Night At Home. Perfect for February 14 and for any of the other 364 (this year 365!) days of the year. Even the simplest of dishes become special when served in courses. Turn off the television, set a beautiful table and enjoy the space between the appetizer and the salad. It’s a chance to slow down, look into the eyes of someone you love and talk about more than just the day’s events. Ours is a classic four-course menu. Five if you’re counting the bubbles. 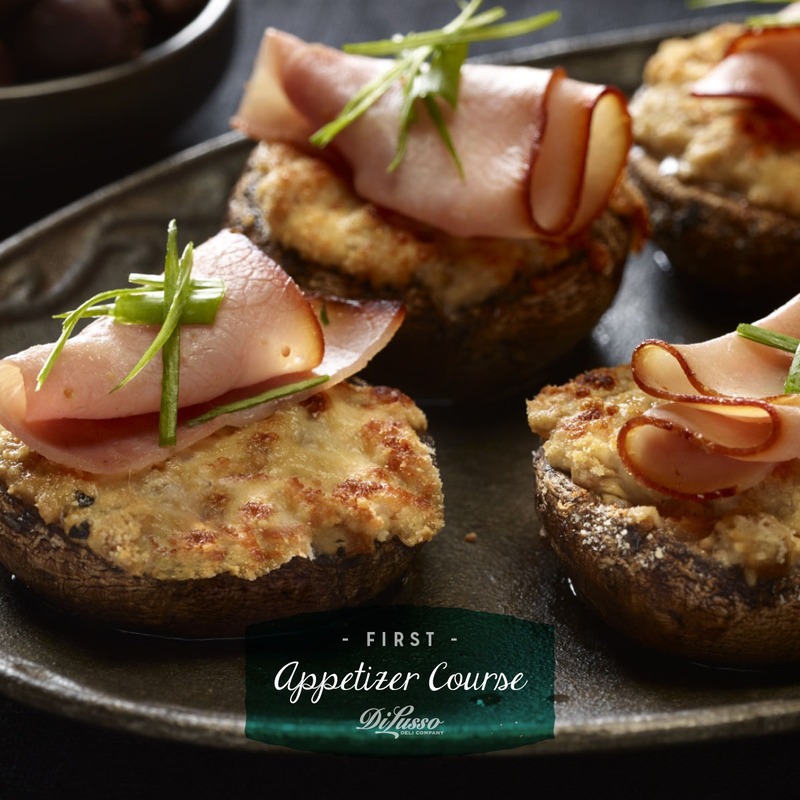 Stuffed Mushrooms with Ham are a favorite of ours and a perfect starter course. These small bites, filled with decadent cream cheese and topped with folds of savory ham can be easily prepared ahead of time so all you have to do is slip them into the oven once the champagne is popped. Place just a couple on small appetizer plates. It’s all about whetting the palate and anticipating the next course. 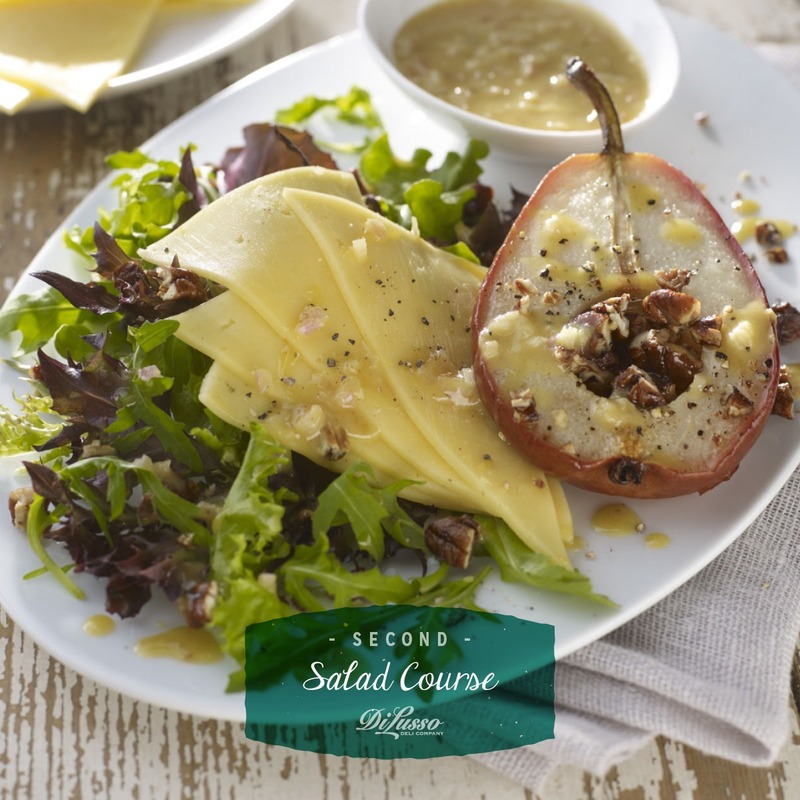 Next up is a gorgeous Roasted Pear & Smoked Gouda Salad – it’s a special treat with unexpected flavor pairings. Easy to prepare in advance and plate beautifully, all while keeping the rhythm of your courses moving. The French-inspired third course and main entrée is a classic, romantic dish with especially beautiful plate appeal. 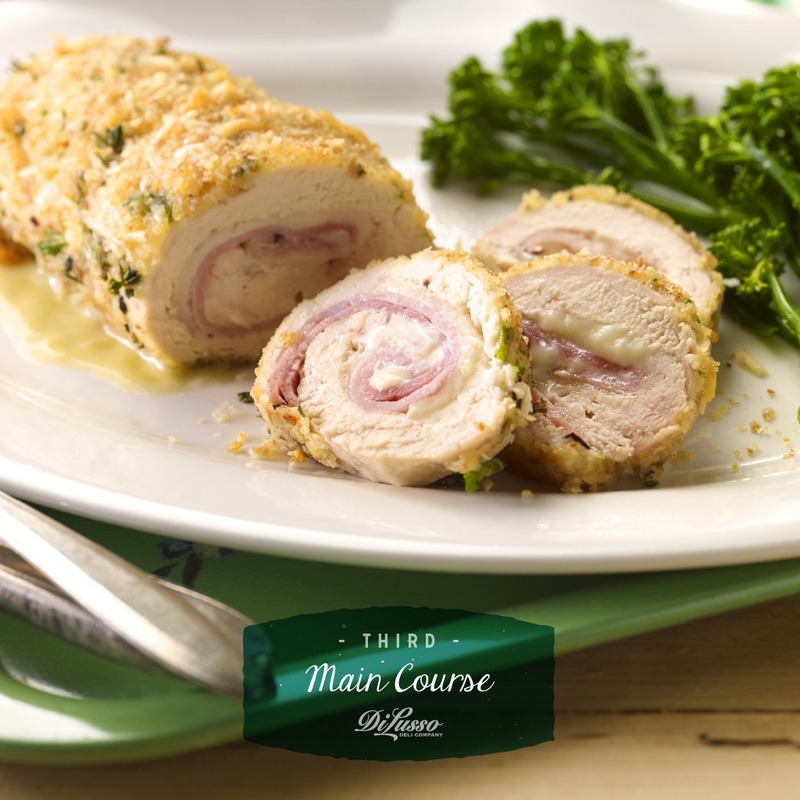 Our Chicken Cordon Bleu Rolls with Black Forest Ham and Baby Swiss can be served whole or sliced into lovely pinwheels, and like the first two courses of this date night dinner, can be easily prepped in advance and baked just in time for serving. In keeping with the French theme, simply prepared haricots vert (green beans) with unsalted butter and course ground black pepper make a perfect side. Drizzle with Hollandaise for a splash of decadence that’s as delicious with the green beans as it is with the main. 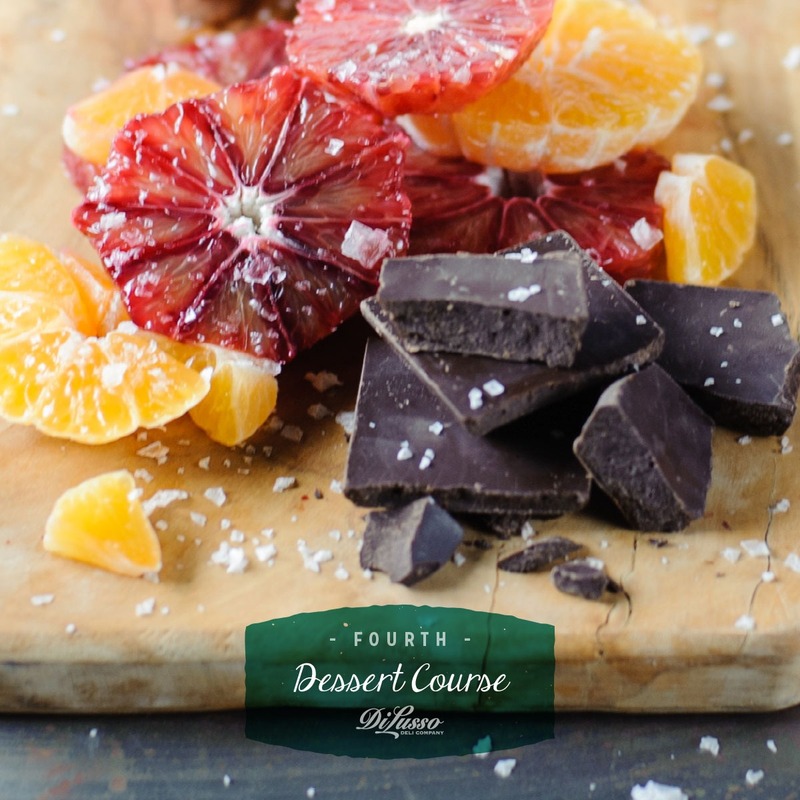 Finish with a final dessert course of blood orange and dark chocolate. It’s easy, elegant and a delightful blend of harmonious flavors.